The rupee on Friday hit over two-year low amid continued selling by foreign institutional investors in domestic stock and debt markets. The rupee slipped over 0.4 per cent or 32 paise at its day low to 66.88 per dollar, a level last seen in September 2013, when India was in the midst of a current account deficit crisis. The rupee tumbled in line with its Asian peers due to persistent risk-off sentiment on the back of broad dollar strength. The dollar held near an 8-1/2-month peak on Friday, while the euro hovered around seven-month lows on expectations of additional stimulus from the European Central Bank next week. The Reserve Bank of India likely sold dollars through state-owned banks to stem the rupee’s fall around 66.88 per dollar, Reuters said quoting state-run banks. Selling by FIIs is the biggest reason for the slide in the rupee, traders said. Foreign investors have been net sellers of Rs 7,467 crore of equities in November so far. This is the third month in last four when foreign investors have resorted to large selling in cash markets. The selloff by foreign investors comes ahead of a possible hike in interest rates by the US Federal Reserve next month. The likelihood of the Fed raising rates for the first time in nearly a decade has led foreign investors to exit emerging markets like India for the safety of US bonds, traders said. Month-end demand for the dollar from importers also weighed on the rupee, traders said. Currency expert Jamal Mecklai told NDTV that a close below 66.80 per dollar would be negative for the rupee. “A head and shoulder pattern is likely to emerge, which will pull down the currency by another one rupee,” he said. 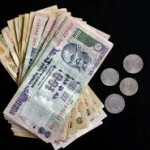 The rupee, which had closed at 66.56 per dollar on Thursday, traded 0.3 per cent lower at 66.76 per dollar as of 10.12 a.m.